14s - 18s must be accompanied by an adult. No refunds will be given for incorrectly booked tickets. 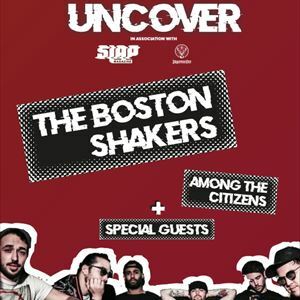 In association with the incredible Slap Mag and Jägermeister, we're bringing The Boston Shakers back to Worcester following their incredibly successful performance at Worcester Music Festival 2017. Backed by This Feeling, The Boston Shakers bring "an infusion of heavy beats mixed with fuzzy guitars, shaken with raps and garnished with a dash of white noise"
Supporting them will be local favourites Elephant Peel, fresh from the release of their latest EP, Stay At Home Yoko, they'll be treating us all to their incredible garage punk sounds. Reminiscent of the Kinks, 13th Floor Elevators and sharing elements of your other favourite classic bands. They write a hell of a tune and have a great stage presence to boot. Joining them as part of their UK tour will be Among The Citizens, a 4 piece indie/alternative band based near Peterborough, UK. The band have collaboratively created their own distinct sound from a blend of influences such as The Cure and Echo and The Bunnymen with their dreamy, infectious chorus guitar, as well as contemporary artists such as JAWS with their lush and memorable synthesiser/guitar melodies. Among The Citizens have received radio support from BBC 6 Music, BBC Introducing and Amazing Radio and won the New Music Generator award for Breakthrough Artist voted for by a panel of music experts from across East Anglia. SUE will also be joining! A Noise Rock/Post-Punk/Punk Rock band from the West Midlands. Known for their wild performances and scratchy DIY punk sound, they have been parading around their local scene with confidence and an obvious passion for what they do. Their wails and whines, their distorted tones and frantic rhythms will grip you from start to finish. They embrace the chaos that lies within all creativity, using it to fuel the fire that let’s them to be the best they can be. They love what they do and have a fantastic time doing it.